Before summer ended, I spent the afternoon with Gin exploring Main Street. Both of us had been wanting to try The Fish Counter for a long time, and couldn’t find a better time to check it off both of our lists! 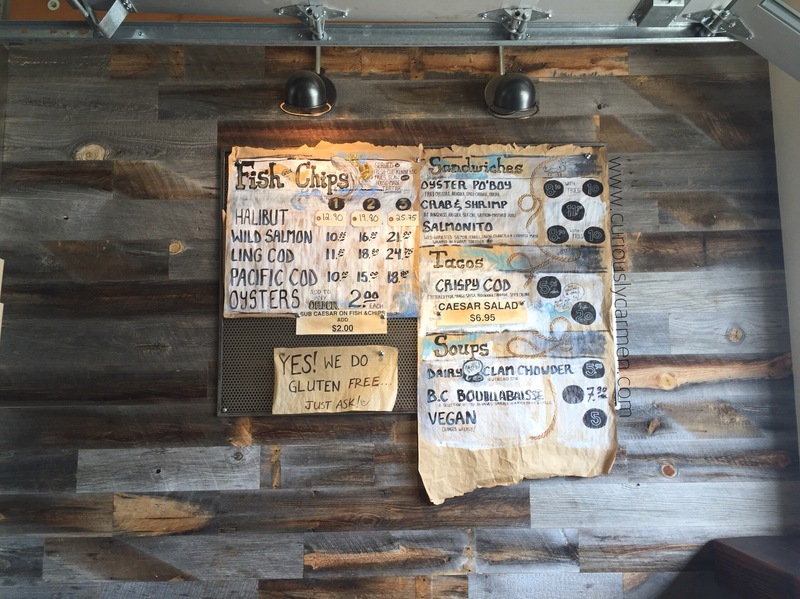 The Fish Shop serves up sustainable seafood, and all products are Ocean Wise. The place reminded me of a cool, local seafood shop. Since it was a nice and sunny day, the windows were all open and so was the patio. The sun was coming in, the air was fresh and warm – what more could you ask for? It took us quite a while to decide on what to order as everything looked so delicious! We ended up splitting three items for lunch. 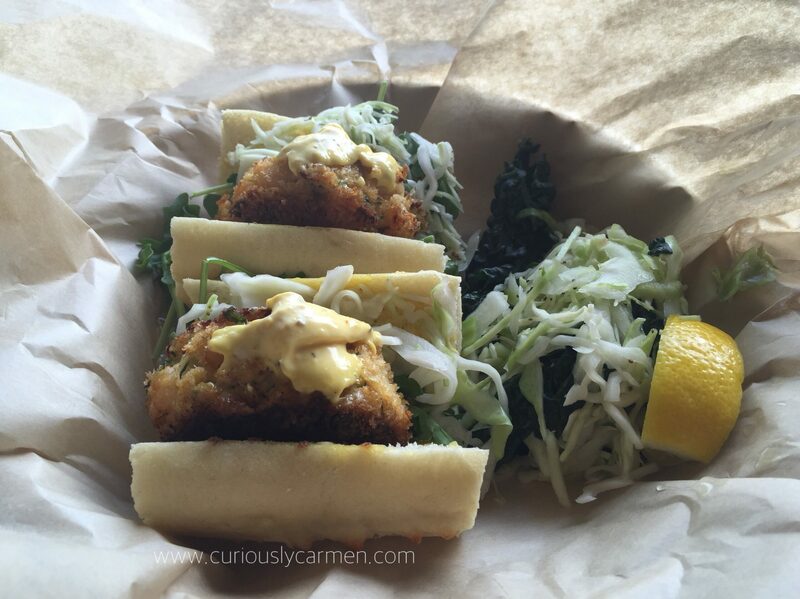 The first thing we ordered was the special that day, the Greek fish taco. This caught my eye because I am a HUGE fan of Greek food and I can’t pass down anything with tzatiki sauce. Seriously, I don’t normally tend to finish all my dipping sauces with my food but when it’s tzatiki sauce… I’ll gobble it up so fast before you know it was there! 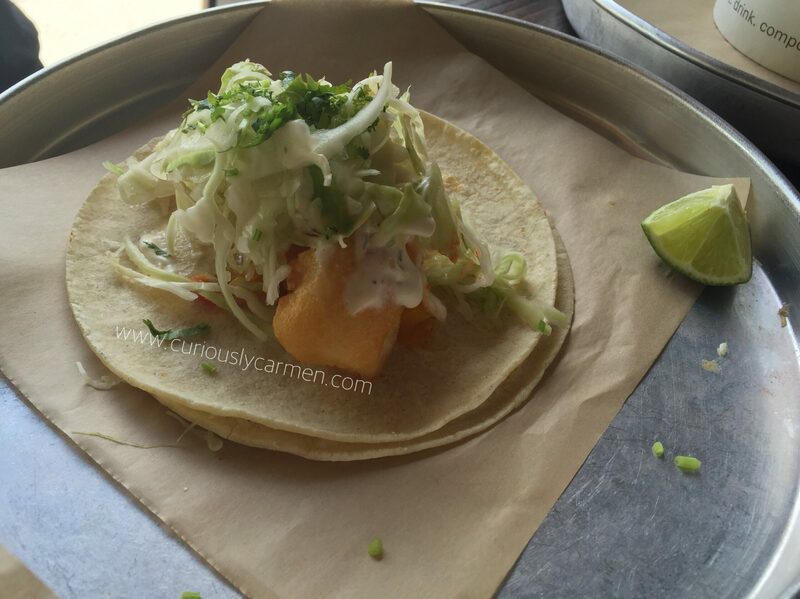 Everything tasted really fresh but unfortunately, we both found this taco to be lacking in taste and very plain. 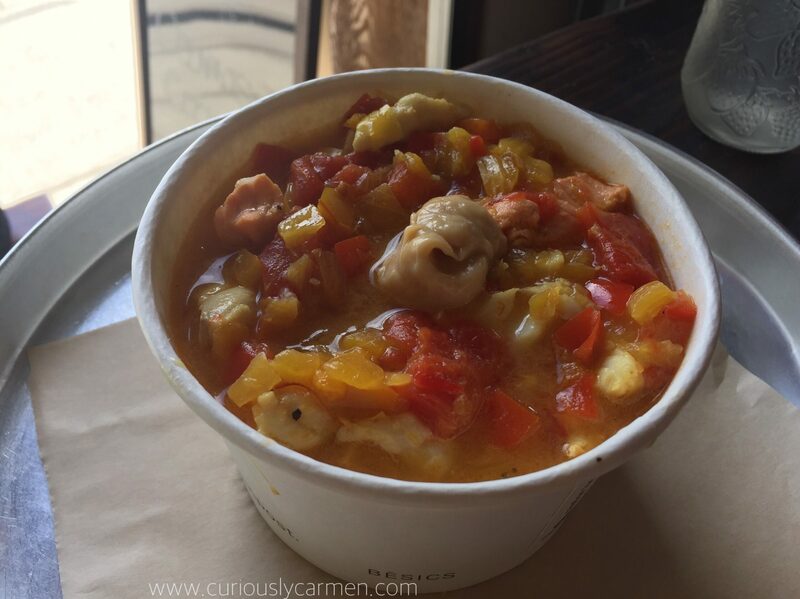 We were torn between the chowder and BC bouillabaisse, and ended up deciding on the latter. This soup was seriously amazing and was a seafood lover’s dream. There was an extremely generous amount of seafood – with every scoop we had, there was an abundance of fish, clams, shrimp, etc that came along with it. We really enjoyed the soup and would order it again in a heart beat! I must warn you though, if you’re not a seafood lover, you might find this soup a bit too ‘fishy’ but we thought it was absolutely perfect. The last thing we ordered was the crab and shrimp baguette, or pretty much a shrimp/crabcake baguette 😉 Again, all the ingredients were really fresh and the flavours went well together. The baguette was nice and soft too, while the side salad came with fresh and crunchy vegetables. I would recommend squeezing a bit of lemon juice on top to further accentuate the flavours! Since this place is mostly self serve, you clean up after yourself once you’re done eating. Overall, we really enjoyed our first experience at The Fish Shop and I would recommend this place if you’re a seafood lover. 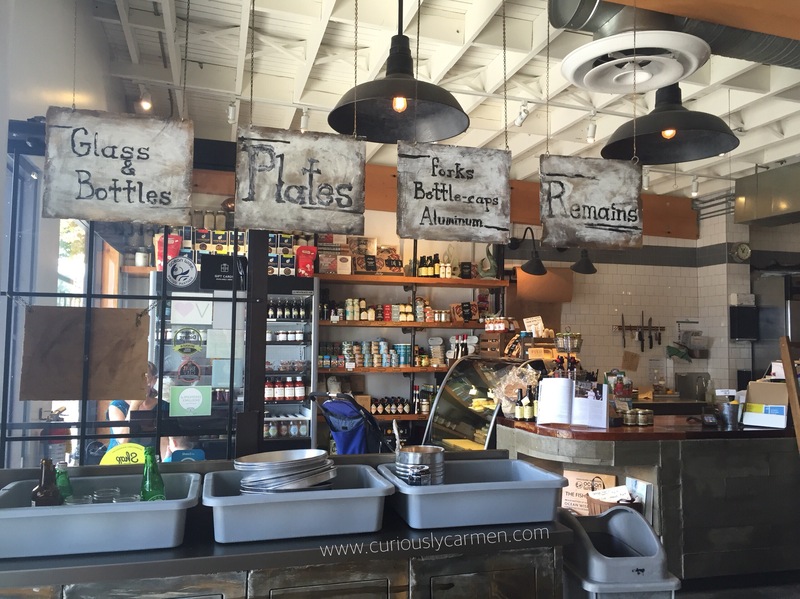 All the ingredients they use are really fresh and the quality of the food is definitely there. Since the seating area is a bit limited, this would be a good place to order take out as well. The staff are also extremely nice and welcoming! On the other side of the restaurant is their actual fish shop! We didn’t buy any seafood to bring home to cook that day, but the option is there for those who want to. My first impression of this place was not great, but I was willing to give it a second try. Lack of service and the amount of oil they put in some of their dishes was what tainted their reputation for me. The food at Sandy La is drenched in oil, to the point where on both occasions, I had a tummy ache. They are also not properly staffed, and the few staff that they do have, are not properly trained. The owners of Sandy La try to cut corners to maximize their profit, but it clearly does not work. It’s unfortunate because once you strip away the service, restaurant layout, and oiliness, the taste of the food itself is pretty decent. We made a reservation at the restaurant for 7pm. However, we were told that there wasn’t a table for us, which was frustrating because that is the point of reservations! There were two large tables open for bigger parties, but they did not want to give us those tables since we only had six people. When we finally talked to a server, she pointed at the table in the corner and said that we had to wait until they were done. The wait was uncomfortable as well due to the small size of the restaurant and also the way that it is designed. When you first walk in, you open the door which leads you to a small area. There is a second door that you have to open to get into the restaurant. The purpose of this is to block out the cold air, which is trapped in the small area. HOWEVER, they put the second door right across from the first door so that it’s basically useless since cold air still gets into the restaurant. THEN, there are tables right in front of that second door so whoever sits at those tables will still be freezing. During our first visit, we were sitting close to the doors so it was really chilly, we couldn’t take off our jackets. I’m guessing again, that the owners wanted to maximize seating area. But clearly, this design does not work and is uncomfortable for those who have to wait. After almost 45 minutes of waiting for our “reservation”, we were finally seated! We quickly ordered because at this point, we didn’t want to wait anymore than we already did. In total, there were only three servers during peak which is why service was so slow. They could have used at least two more servers. The server came by promptly with a bowl of soup, which was complimentary since we waited for a long time. It seemed pretty oily to me so I only had a few sips. The boyfriend’s brother noted that there was a really strong MSG flavour on it. 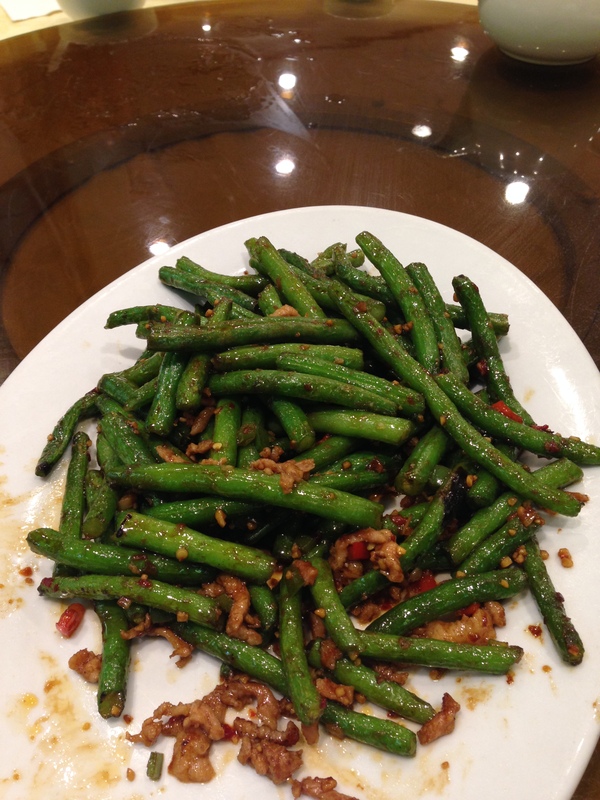 This was the pan fried spicy beans ($10.95). I understand that the beans are pan fried, but these ones are a lot more oily than the ones I have at other Chinese restaurants. The taste of these beans are good, once you get past the oil. They were pretty crunchy and had the right amount of spice. They also are not stingy with the amount of meat that comes with this dish. Up next was the beef and broccoli chow mein. Again, I did not each much of it because I was scared I would get a tummy ache again. I could already feel my tummy churning from the oiliness of the pan fried green beans. This dish was pretty good though. 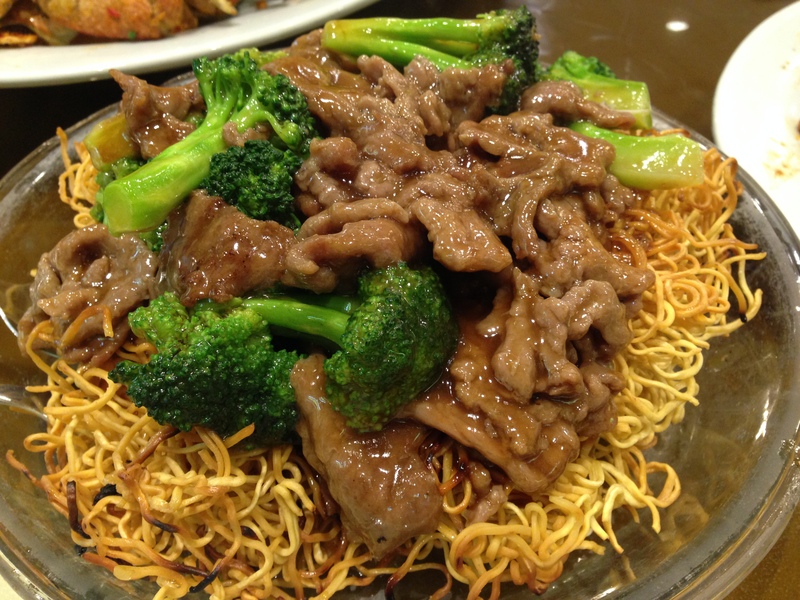 There was a perfect crunch to the noodles, and the sauce/beef/broccoli are up to standard. In a city like Vancouver where it is filled with authentic Cantonese dishes like this, it is easy to tell right away which restaurants can compete and which can’t. I would like to order this dish again! The boyfriend’s family brought the crab to the restaurant, and asked for them to make it a certain style. I’m not too sure what the English name is but it’s something similar to deep fried garlic flakes and spices. I thought this dish was delicious. 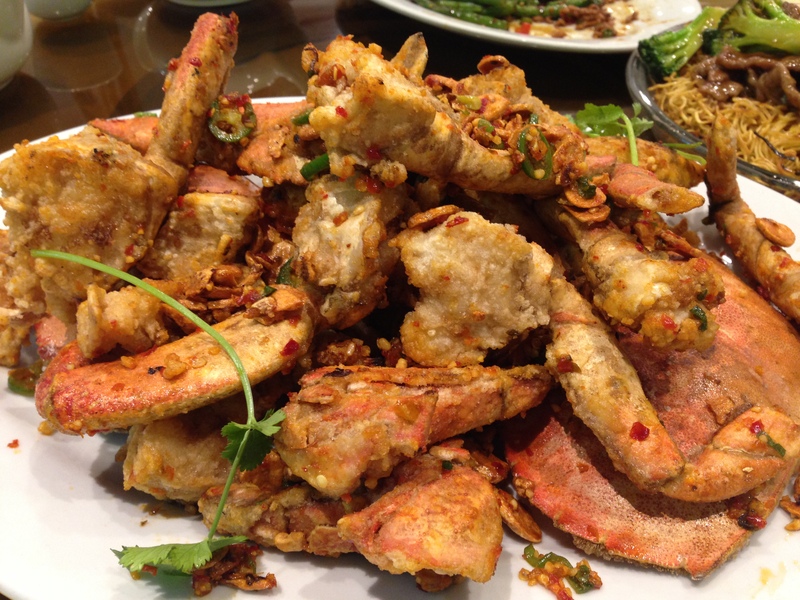 The batter of the crab was really fresh and crunchy, instead of soggy batter that you may find at other places. The seasoning of this dish was perfect as well. I have high standards for this dish since I grew up owning a Chinese restaurant, and my dad made this dish perfectly – almost heavenly 🙂 No one can cook this type of crab as good as my dad and I’m not even trying to be bias! This satisfied me very much and I would order it again. One thing though, it took us awhile to have the server bring us the clamp to break open the crab. But otherwise, YUM! This dish is the only reason why the boyfriend’s family comes here as opposed to other restaurants. This is squab, otherwise known as pigeon but I was taught today that pigeon is the incorrect term for it? Anyways, this dish, again, was delicious. Nothing to complain about with this dish. I didn’t try it because it was too oily for my liking, but everyone else enjoyed it thoroughly. 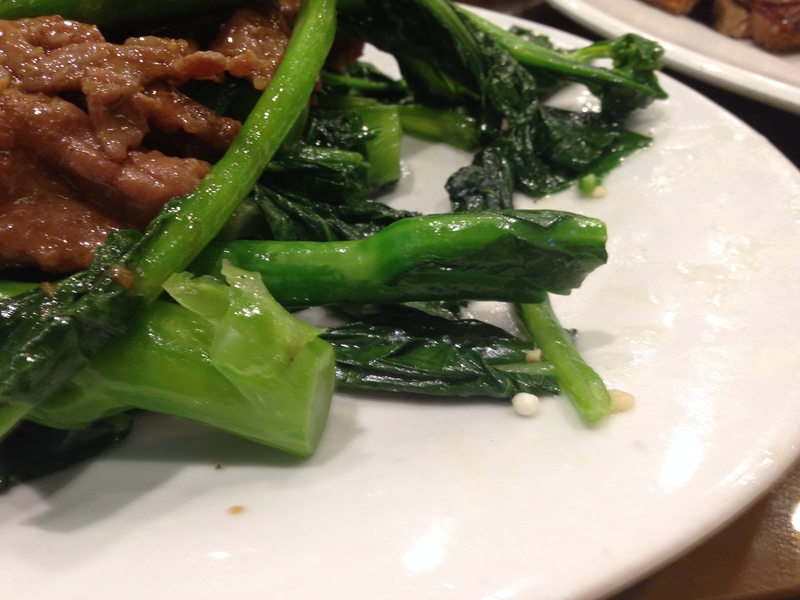 If you are going to come here, definitely give this dish a try! This was the beef and vegetable dish. I took a better picture of this dish but I can’t find it on my phone anymore so this will have to do. Anyways, this dish seemed very oily and was very shiny when you looked at it, which put me off. I ended up eating it, but washed off the oil in hot water in my bowl. I would not order this dish due to the oiliness of it. The good thing was that there was a generous portion of beef and sauce. We also sound a styrofoam circle in the dish, if you look carefully, center-ish towards the bottom right. Not sure how it got there but oh well. 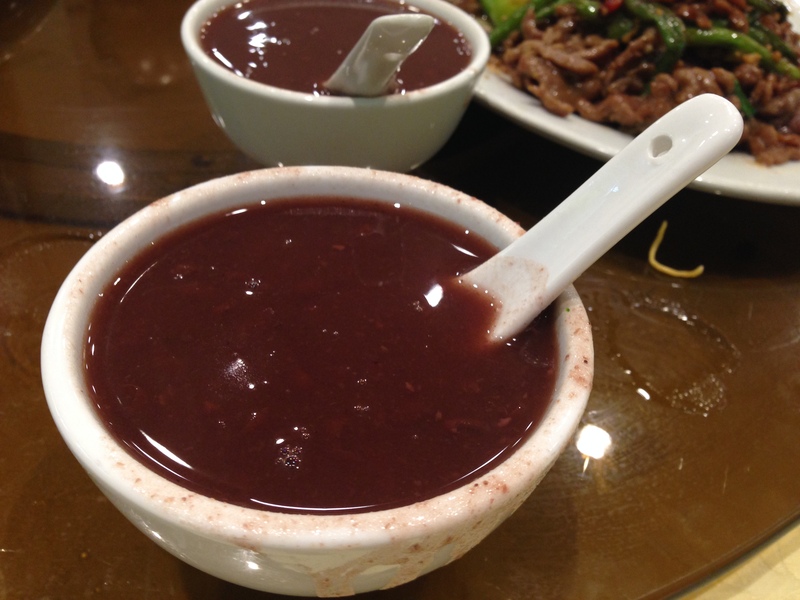 Lastly, came the traditional red bean dessert. 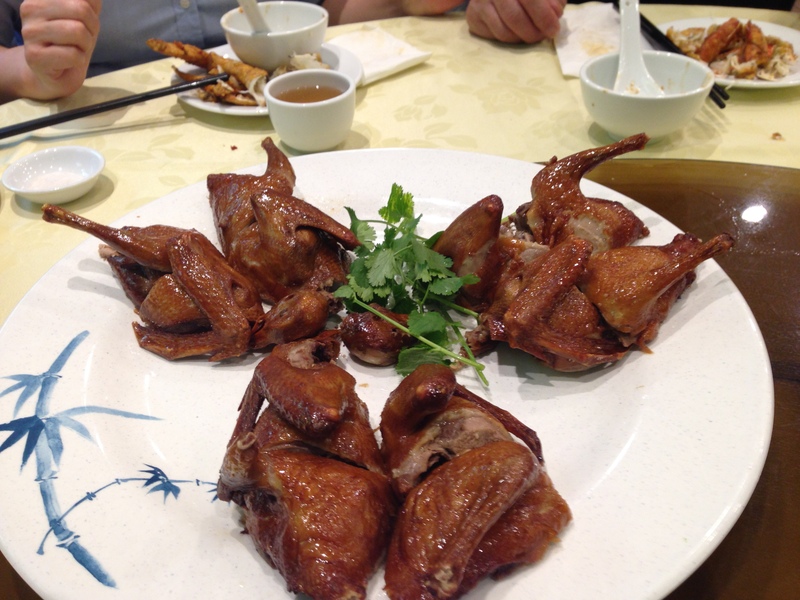 Right off the bat, the boyfriend’s brother noted that their dessert was better than most Chinese restaurants. Theirs had a thicker texture to it, and was also not as watery in contrast to other places. It was also very sweet so it accomplished the goal of a dessert! At the end, our server told us that they gave us a discount on the crab, which was nice of them since we had a lengthy wait. It was originally $7 a pound but they charged us at cost, which was $3.50-4 I believe, I can’t remember exactly. My recommendation is to definitely try the squab and crab, but be wary of their vegetable dishes as they are super oily. I would also recommend coming here past prime dinner hours even on a weekday, since we made reservations but had to wait around 45 minutes. In conclusion, their food is pretty decent once you get past everything else. When it all comes down to it, you go to a restaurant to eat and enjoy their food, which is we did enjoy the majority of our food. It’s just a shame that everything other than that was lacking, from their service, to long wait times despite reservation, and layout of the restaurant itself. Trying to be efficient is great and I applaud efficiency, but Sandy La cuts too many corners when it comes to hiring servers and seating space to the point where it’s not efficient anymore.